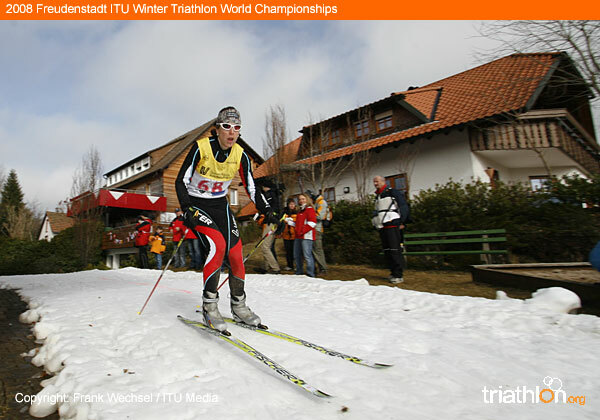 The irrepressible Sigrid Mutscheller of Germany has won the ITU Winter Triathlon World Championships for a record sixth time. She delighted the home crowds by leading a gold-silver sweep for the home team. Mutscheller won with a time of 1 hour, 51 minutes and 4 seconds, almost a full 90 seconds ahead of her closest competitor. Her team mate Anke Kullman won her first World Championship medal, taking the silver while Austrian Carina Wasle, last years runner-up, came across for the bronze. From the beginning of the final leg, Mutscheller took command and stole the lead from Wasle for the first time in the race. After the first lap the defending champion opened up a 30-second gap, then parlayed that into a 90-second lead. From there, Mutscheller never looked back and the final result was inevitable, the same result the sport had seen at five previous World Championships. The battle was now on for silver and bronze. Wasle wasnt able to hold off Kullman, another charging German who surged past for the silver while Wasle settled for the bronze. Rivas delighted the home crowds easily winning the womens title over compatriot Melody Ramirez. Rivas began the race with the fastest opening run split and managed to hold onto that lead through the 1-kilometer swim and the final run leg. Dunia Gomez made it a Mexican sweep of the womens podium with the bronze. 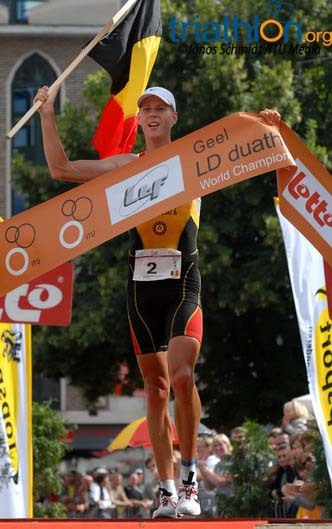 Joerie VanSteelant of Belgium and Catriona Morrison of Great Britain have successfully defended their titles at the 2008 ITU Long Distance Duathlon World Champions. The two duathlon stars played to their strengths to pull away from the competition in decisive wins in both the mens and womens competitions of the run-bike-run event. The official distances of the 2008 Geel ITU Long Distance Duathlon World Championships are an 18-kilometre run, 74-kilometre bike and 9-kilometre run. Morrison was the heavy favourite coming into the competition as last years champion and two-time Duathlon world championship medallist and did not disappoint, breaking the tape first in a time of 3 hours 44 minutes and 23 seconds. In second place was Mariska Kramer-Postma of the Netherlands two minutes and 23 seconds back. Germanys Urlike Shwalbe claimed the bronze in her first long distance Duathlon world championships a further one minute and 35 seconds back. In the mens event, reigning world champion Vansteelant gave the local crowds something to cheer about as he rode away from the competition for his third long distance Duathlon medal in as many years. Finishing second was another Belgian, Bart Aernouts, four minutes and five seconds back. Rounding out the podium was Lino Barruncho of Portugal in third, another two minutes and 18 seconds down. Chrissie Wellington of Great Britain and Julien Loy of France won the ITU Long Distance Triathlon World Championships in Almere, Netherlands. 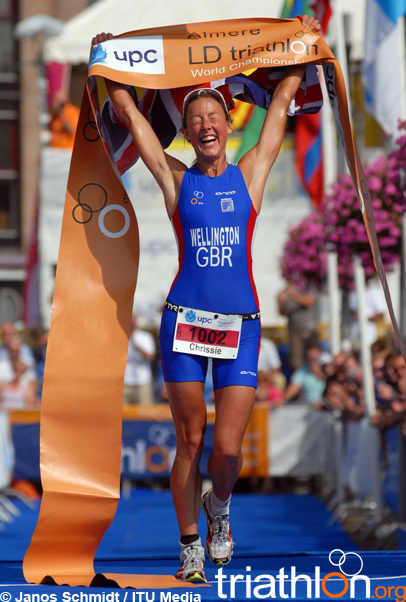 For Ironman star Wellington, it was her first elite ITU world title. She cruised to victory with a dominating performance. Czech Lucie Zelenkova was first out of the water after the gruelling 4-kilometer swim. She was followed by Denmarks Charlotte Kolters and then Wellington a further two minutes down. But it was on the bike that Wellington began to take command. She rode more than six minutes faster than any other woman. She followed that up with the fastest 30-kilometer run split of the field to coast to the finish line. Kolters took the silver while Dutch long distance star and home favourite Yvonne van Vlerken delighted the crowds with the bronze. Olympic silver medallist Vanessa Fernandes of Portugal successfully defended her ITU Duathlon World Championship today in Italy. It was a commanding victory for Fernandes who finished ahead of 2-time Long Distance Duathlon World Champion Catriona Morrison of Great Britain and double Olympian Ana Burgos of Spain. Fernandes opened the race with the fastest 10-kilometer run among the women, taking a 44-second lead heading out onto the 40-kilometer bike course. One of the most powerful cyclists in the sport, the defending champion extended her lead with the fastest bike split. Glasgow’s Catriona Morrison cut the deficit to put herself in medal contention but no one challenged Fernandes who coasted to victory and won by more than 90 seconds. “Today I could do a good run and a good bike, it was a surprise for me but I think it was a good way to finish the season so I’m happy,” said Fernandes. Since taking silver at the Beijing Olympic Games, Fernandes won her 9th European title with the under23 championship and now her second Duathlon world title. Paul Amey won his third ITU Duathlon World Championship on a day marred by controversy. Belgian Rob Woestenborghs was first across the line but after his own teammate lodged a protest, he was later disqualified by race officials. The controversial men’s race opened with a pair of Portuguese men, Sergio Silva and Lino Barruncho, taking the early lead. But the main players, Amey, Woestenborghs and Belgians Bart Aernouts and Jurgen Dereere trailed by just seven seconds. The drama began early in the 40-kilometer bike segment as all six men were in the lead pack. According to Dereere, his Belgian teammate Woestenborghs was cycling dangerously. Eventually Amey, Aernouts and Woestenborghs broke away and went on to post the three fastest bike splits of the day by almost two full minutes. That lead was enough for all three to secure the podium.